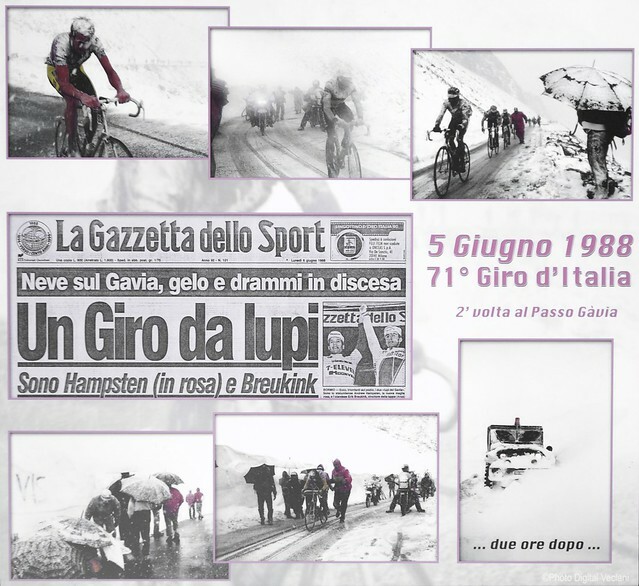 Considering the digestive issues experienced by said "Directeur Sportif" he chose the Gavia to test his constitution before the harder Stelvio, leaving us the looming Mortirolo ´till last, granting it equal par with waiting for a colonoscopy. The roll out to Santa Caterina was a delight, rolling alpine meadows, the broad sweeping roads matched by the equally broad smiles on the faces of the descending cyclists, blurring smudges of humming speed. Although you're constantly climbing, its not tough, and the few short ramps serve to get your HR up ready for the real climb ahead. The ascent starts with an immediate switchback out of Santa Caterina, taking you high above the ski resort with startling rapidity. The climb through the pine trees takes you through several short switchbacks, granting you alternating panoramic views of the peaks that dominate this valley. They remind you that you have a long way to go! As you climb, the road narrows, the pine trees thin out along with the retaining walls and meadow encroaches on the asphalt. The constriction of the tarmac ribbon you're following creates a sense of intimacy with the climb, as if its just you and the mountain. The climbs ascends through verdant greenery at a steady incline that infuses your quads with an almost comforting and reasuring sense of effort. Comforting that is until about 19km. The climb has been taking you up at a steep but steady incline for a while, and then as you round a hairpin that crosses a cascading mountain stream, it throws a sudden ramp of over 10% at you. This section takes you by surprise and jolts you from your seat like your Dad kicks you out of his favourite chair. The ramp is thankfully short, but you don't know that the first time do you! Doubt enters your mind as you start to think that if the last few K are like this, you´ll need to get off. You're grateful when the climb returns to a steadier incline and it feels almost flat as you approach the Church and the stone memorial of the Battle of San Mateo. I lingered here for a while, waiting for Harbs, and taking in the scenery. Some old fella was occupied maintaining the edifice. No idea if this was occupational therapy, or just some random demented loon. I romanticised that he was actually tending the memorial as a labour of honour and respect for those that lost their lives fighting in these remote passes during World War I. Its seems almost sacrilegious to have violated these serene and peaceful mountains with artillery fire and bloodshed. The Rifugio Bonetta is a short ride further on, and offers a potted history of the Gavia on its walls and placards. We had a few beers and enjoyed the afternoon Sun. Some say the route from Bormio is the "easy route", this may be, (I´ll find out another day!) but this was a beautiful and intimate climb that sustains the heart rate and inspires the soul. A great first ascent of the Italian Alps.